Honeymoon Safaris - Tailor made African Safari & Beach Specialists! Taking an African Safari for your Honeymoon has always been an exotic and adventurous choice, following the romance of the old explorers! For many people a Safari is a once in a lifetime experience so to save up and splash out on your honeymoon is a great thing to do. If at any stage in your planning you are just too confused by the selection of safari options, contact us now on 01728 748209, link to the Live Chat on this site or fill out the enquiry form. HONEYMOON GIFT VOUCHERS AVAILABLE. Everyone is different and wants something special out of their trip of a lifetime and with Jules' 20 years experience, plus niche specialism for tailor made Africa holidays, we can find you the perfect solution! Here are just some of our favourite ideas for Safari Honeymoons and if you go to the Special Offers page, you will find just some of the safari camps and lodges (or beach lodges in Africa) which are offering discounts or specials for honeymoon couples. If your honeymoon is your first safari you might want to head for the classic safari destinations such as the Masai Mara or the Serengeti but don't rule out some of the more remote destinations - Zambia and Botswana offer amazing luxury safari camps and a very personal guiding experience. If you have been on safari before and perhaps did the more basic adventure camping option, why not treat yourselves to some luxury along with fabulous wildlife sightings? Sometimes, there is just that 'once in a lifetime' moment that you have to do and your honeymoon might be the best opportunity to do it! Some of the extreme honeymoons that couples choose in Africa include climbing Kilimanjaro, trekking Mountain Gorillas or a Cycling Safari. Intimate wildlife experiences such as Chimpanzee tracking or being in the heart of the Wildebeest migration will be remembered all your life. Botswa na offers a relaxing honeymoon option as most safari camps are fly in only, so you don't have hours on bumpy roads to get to your destination! Drifting in a dug out canoe being 'punted' through the channels of the Okavango Delta or watching the sun go down from the luxury of your private plunge pool is a great way to experience the massive expanse of wilderness areas in this country. If you like the idea of a camping safari with a private guide and a cook to prepare all your food, ask us about a tailor made private honeymoon in regions of your choice, travel as they did in the days of the explorers! Sleep under the stars in the Kalahari Desert or on the pans or eyeball a Meerkat family! Zambia has a unique feel to it and has some superb honeymoon options, including a couple of places you can actually get married, such as Tongabezi near Victoria Falls or in the heart of the South Luangwa National Park. The camps in Zambia tend to be small and intimate and can offer you a honeymoon experience of a different kind, with things like sleep out platforms in the bush or luxury bush camps. Both Botswana and Zambia honeymoons can include time at Victoria Falls where there are some gorgeously romantic places to stay. Tanzania has some special honeymoon options inlcuding both safari and beach. On the coast, try the Venus Suite at Tent with a View Safari Lodge at Saadani, or sleep in a treehouse at Chole Mjini for some fabulous 'Robinson Crusoe' time. Check out the Tanzania destination page for ideas on safaris in different national parks. Zanzibar of course is traditionally popular for both weddings on the beach and honeymoons and has a wide range of beach villas and lodges, for something special try the Baobab Suite at Fumba Beach or a bed on the roof of a suite at Shooting Star Lodge. Although Kenya is probably most popular for traditional safaris and the Masai Mara, take a look further afield for some unusual honeymoon ideas - ask me about the lodges around the Laikipia region, stunning views and in some places you won't see any other tourists! Try Loisaba's star beds or take a private guided walking safari in the hills with Samburu Warriors. On the coast north of the Tana Delta is the wonderful Delta Dunes lodge with miles and miles of empty beaches and to the south away from the busy Mombasa resorts head for Funzi Keys - a tiny island with huge suites complete with jacuzzi baths where you can dine on the beach with a campfire, take a sunset dhow ride or dive in the nearby marine park. 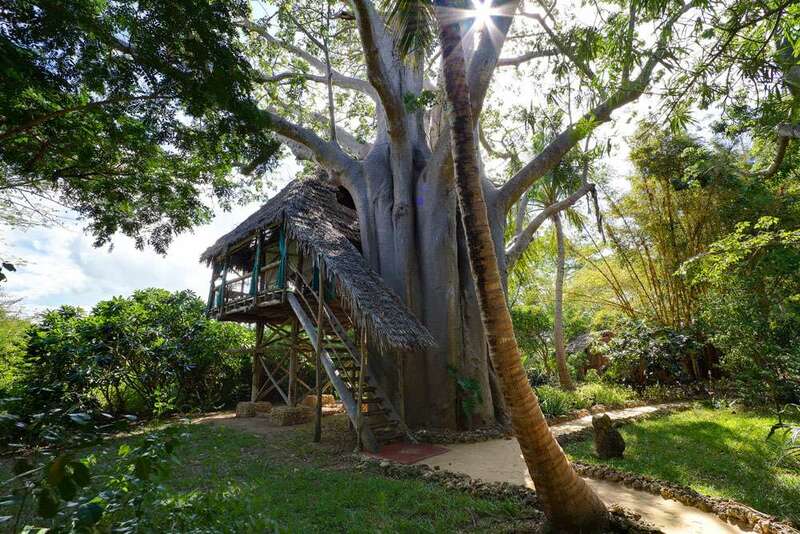 One of Jules' favourite honeymoon places in the whole of Africa is Kutazama Lodge, just 45 minutes from the Diani Beach area of Kenya - simply stunning, ring to find out why! Heading further south if you are honeymooning in our winter, then Cape Town and South Africa are favourite destinations. If you are into food and wine then the Western Cape is probably the most 'foodie' place in Africa! Stay in some luxury accommodation on the wine farms, watch whales from your balcony at some of the coastal lodges and parade with penguins at Boulders Beach! Some dramatic places to 'pop the question' (too late if you are on honeymoon I know but you might be planning it!) include Cape Point and Table Mountain. Along the Garden Route if you would like a self drive African honeymoon, stop at places such as Phantom Forest near Knysna with it's eco-style and funky boutique feel and you can combine this with a safari in one of the Eastern Cape Game Reserves. In fact, Shamwari have been known to throw in a free wedding package with your safari, so you could tie the knot and then continue on honeymoon! Mozambique has some stunning islands and beaches and has a good year round climate, so ask me about options for honeymoons on the Indian Ocean shores of Africa. Places like Nuarro Lodge in a sheltered bay give you chance to see whales, kayak, dive and simply relax into a laid back way of life long forgotten in our western world. Combine Safari with beach in Mozambique by heading to Explore Gorongosa, a traditional safari camp in the heart of a giant wilderness area, who also have some honeymoon offers available. Combining your safari with beach doesn't have to mean heading to the coast. Try some of the gorgeous lodges around Lake Malawi such as Kaya Mawa on Likoma Island, Nkwichi Lodge on the Mozambique shores of the lake or Mumbo Island for something different to give you the down time you need in one of the friendliest countries on Earth! You can safari in Malawi too, spend time in Liwonde National Park or at Majete, fast becoming a popular destination for African Safaris in Malawi. For adventures with Gorillas or Chimpanzees honeymoon in Rwanda or Uganda - both of these countries offer friendly hospitality and truly stunning scenery with volcanic hills and lakes, thick forests and colourful people and wildlife. Raft the Nile, hike in one of the last remaining true rainforests (Nyungwe in Rwanda), or relax at Lake Kivu or Lake Victoria. If you prefer to see your wildlife on foot and are a keen natural history enthusiast, how about Madagascar? A very popular option for 'safari' honeymoons where you can combine lemurs of the forests with superb wild beach lodges. See the Madagascar pages for more ideas. If you do want to combine your African Safari Honeymoon with a beach a bit further away, head for Mauritius, Reunion, Rodrigues or the Seychelles. Please be aware that these kind of twin centre holidays are difficult in terms of the length of flying time and price of the flights, but they can offer a superb contrast of the African bush and exotic Indian Ocean beaches. Many hotels on the Indian Ocean islands have honeymoon offers and special honeymoon rooms and treats, so ask us about which ones are right for you. Trying to strech the honeymoon budget? Wedding guests can help with the cost of the honeymoon, ask me about gift voucher schemes or gift lists which some operators can offer where your guests can buy 'items' for your honeymoon such as a scuba dive, bush dinner or a hot air balloon ride. Whatever you want from your African Safari Honeymoon, get in touch as soon as you know your dates and we will do all the research for you and get it all booked up so you don't have to do a thing except count the days! Two vintage luxury traditional small camps in private wildlife management areas of North Tanzania. Combine safari in South Luangwa with Victoria Falls in this fabulous Zambia holiday! A private safari house in Sabi Sands, Kruger. Colonial style manor house sleeping up to 12 guests. Enjoy a Zambian safari at Kafunta River Lodge and Island Bush Camp - walking safaris and home comforts! Visit Mvuu Lodge or Camp in Liwonde National Park, Malawi for wildlife experiences by boat, on foot and jeep. Conservation projects in rural Malawi. Small group authentic camping safaris in Kenya - Masai Mara, Amboseli & conservancies. A wonderful community based conservation project in Northern Namibia. Authentic tribal culture and desert wildlife. Conservation tourism at it's best! Mumbo Island Camp is the perfect getaway experience! Superb diving and snorkelling and amazing views and tranqulity. Natural and inspiring - go to Mumbo to relax and unwind with friendly Malawi hospitality. South Luangwa National Park in Zambia is one of the best locations in Africa for a fabulous safari! Remote and beautiful, a haven for plentiful wildlife with world class guiding, walking safaris, night drives and luxury camps. Mayukuyuku Kafue Safari Camp - fabulous eco-camp, big cat and wild dog sightings with superb hosting and setting on the river, easy access all year round from Lusaka. A perfect Zambian Safari! Majete Wildlife Reserve in Malawi is an African conservation success story! Visit this beautiful park for a taste of real rural Malawi and stay at the wonderful Mkulumadzi Camp. Zambia is the perfect location for a photographic safari. Kaingo & Mwamba Camps are run by Shenton Safaris who have photographic hides and specialist photography experience in South Luangwa. One of the seven Natural Wonders of the World, Victoria Falls is considered to be the largest waterfall in the world. Spend time here exploring the old town of Livingstone and experiencing a range of adventure activities. Wow! This is one of my favourite places in the world. If you are looking for a luxury honeymoon with a difference or just somewhere to escape the rat race and soak up the atmosphere of tropical Kenya at it's best, this is the place for you! Head to Gambia for the chance to experience real West Africa in comfortable conditions, enjoy a fabulous natural history holiday in unique surroundings that benefits the local community and conservation too. The Eastern Cape of South Africa has a great year round warm climate and a range of malaria free, big 5 and family friendly safari lodges and camps in private game reserves. Ideal as part of a self drive holiday. A fabulous group adventure tour covering Ethiopia from the far north and the Simien mountains right down through the rift valely to the Kenya border including the historical north and lakes and culture of the south.